We have developed Inspector Deep Learning, a part of Riscure Inspector family of software analysis tools that provides an innovative approach to Side Channel Analysis. Inspector Deep Learning will be available in early 2018 to all customers with a valid Inspector SCA Analysis Premium license. Inspector Deep Learning is an extension to Riscure Inspector that stands out from the rest. It applies modern intelligent algorithms to help you boost your Side Channel Analysis routines. SCA, by design, involves finding a specific pattern in a large volume of data, which is a perfect scenario for Deep Learning. Throughout 2017 our team of experts has been testing the new approach and now we are almost ready to deliver this new solution to our customers. Some call it ‘machine learning’ or even ‘artificial intelligence’, although in many applications the latter is a superficial term. Deep Learning is an intelligent algorithm used to analyze large data sets and identify patterns using a deep neural network. This is achieved, in many cases, by ‘training’ a network on a data set with a known result (a number of classes that has to be identified in a data set). A trained neural network can then be applied to a fresh data set to extract previously unknown features and classify them. The advantages of Deep Learning concept include efficiency and better quality of an analysis. The notorious example of a Deep Learning algorithm is an image recognition system that can identify objects. It is trained on a large set of photos where objects images are known and then can reliably identify similar objects on a fresh and unknown photo collection. The advantage is that we don’t spend time describing the properties of the object in question: we define the target and an algorithm identifies the necessary properties by itself. How does Deep Learning apply to Side Channel Analysis? Our research reveals that Deep Learning is the most efficient for Alignment, Point of Interest Selection, Classification of data and Key Recovery. We use a convolutional neural network that can be trained on a trace set to identify the Leakage Model and extract a known key. This process involves a high number of iterations and typically takes a lot of time. But after a Leakage Model has been identified, applying it to any trace sets with similar properties allows a fast key extraction. 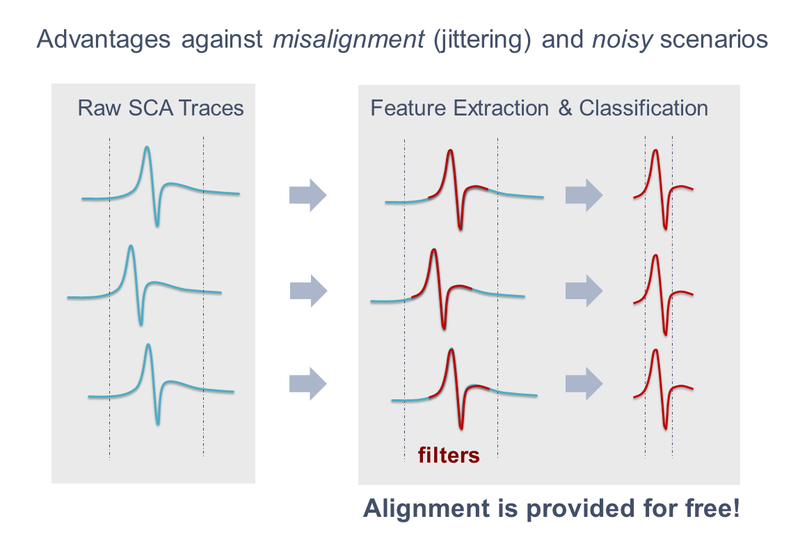 There is more: being capable of identifying the required features in a trace set, Deep Learning literally offers free alignment and is especially effective when dealing with noisy data sets. Alignment, leakage assessment and point of interest selection can be time consuming manual tasks during a side channel analysis project, and they heavily depend on the accuracy and expertise of the analyst to be successful. With Inspector Deep Learning the neural network can be used to perform those activities and in this way increase efficiency as well as the success rate. 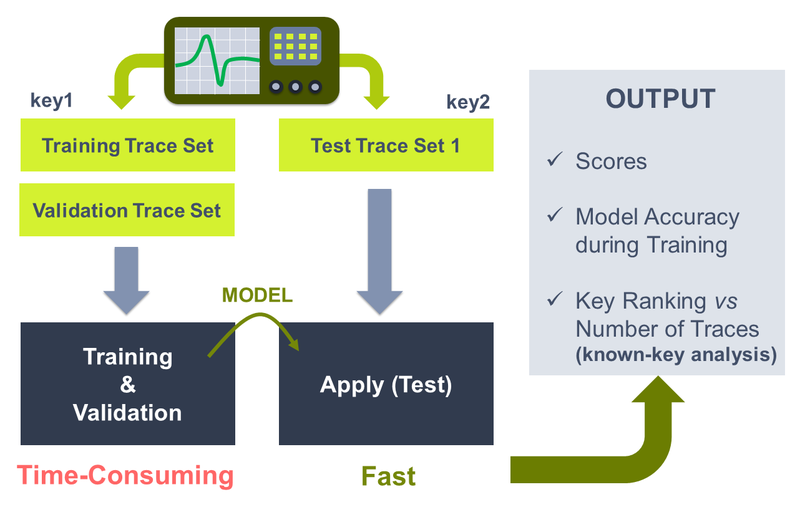 It is easy to train Inspector Deep Learning to the unique quirks of your trace acquisition process, your hardware target and your goals. Replaces ‘human’ research effort with processing power. A great tool to test new attack methods and identify new potential points of vulnerability, allowing you to make your hardware more robust. Evaluation using Deep Learning algorithms has recently become a requirement for a number of common certification schemes. Inspector Deep Learning is currently in its beta test, and we have a number of customers signed up to evaluate. Contact us at security-tools@riscure.com if you would like to participate in the beta program. This new solution becomes commercially available in early 2018. Deep Learning is a feature extension of Riscure Inspector and will not be sold separately. It will be available to all customers subscribed to the Inspector SCA Analysis Premium package. Register to get access to the video presentation of Inspector Deep Learning, recorded at the European Riscure User Workshop in September 2017. In this video Guilherme Perin, Security Analyst and one of the masterminds of Inspector Deep Learning, explains the reasons for developing this new solution and provides a demo. The link to the video will be delivered to your mailbox.